2014’s Godzilla began Legendary’s new take on their shared cinematic universe (known as the MonsterVerse). Kong: Skull Island continues it, curiously enough, with a story set toward the end of the Vietnam War. Considering this and that it features a journey on a tropical island to find a monster in the heart of darkness, it makes perfect sense that director Jordan Vogt-Roberts (The Kings of Summer) would borrow heavily from Apocalypse Now. And borrow he does, both in terms of the visuals and the music. But other than surface level reasons, he doesn’t seem to do so for any particular thematic reason. I honestly couldn’t tell you the significance of the decision to set the film in the 1970’s. 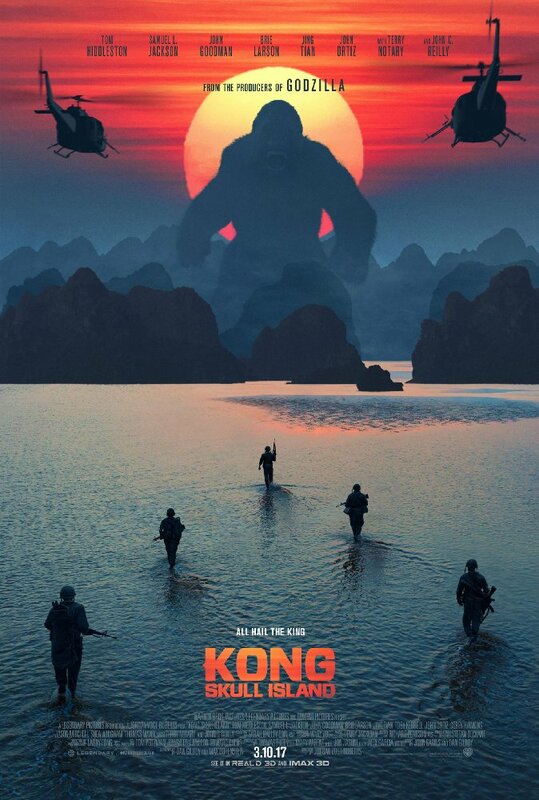 Perhaps it’ll be made clear in several years time when Kong goes toe to toe with Godzilla, but that’s a long time to wait for a justification for this film. In a twist on Apocalypse Now, the monster in this story ends up being one of the members of the group journeying into the heart of darkness rather than the thing they’re searching for. The film puts that role on Samuel L. Jackson’s war hardened Lieutenant Colonel Preston Packard, a veteran on the verge of depression at the thought of an end to the fighting in Vietnam. He eagerly jumps at the chance to take on one more mission. Once they arrive, they’re almost immediately attacked by Kong, who kills many of the Sky Devils and leaves the rest of the group grounded and separated. Packard and most of the surviving Sky Devils begin a hunt for Kong on a misguided attempt to get revenge for the men they lost. Meanwhile, Conrad, Weaver and a few others inadvertently stumble upon a village of mute locals where they find Hank Marlow (John C. Reilly), a pilot who had been shot down during WWII. The locals have fortified their village behind extremely tall walls they lined with sharp spikes to keep the monstrous inhabitants of the island out. Marlow explains that Kong isn’t the one they fear. In fact, they respect him as their protector, who keeps them safe from other monsters. Most notably, he kills the vicious gigantic creatures they’ve dubbed “Skull Crawlers,” who, if left unchecked, would overrun the island and potentially spread to the rest of the world. Marlow soon shows them a boat he’d been slowly building out of scrap pulled from the many shipwrecks and downed airplanes around the island. Together, they finish the boat so they can begin the journey toward the other side of the island where a ship should be coming to pick them up. The two separated groups rejoin and get separated and rejoin again at least a couple of times, but it’s clear the soldiers have different ideas about their purpose on the island than the rest of the group. The film’s most interesting characters are that of Samuel L. Jackson’s Packard and John C. Reilly’s Marlow. We learn the most about Marlow, and Reilly adds a lot of personality to the character. The film is even bookended by scenes devoted to establishing and giving closure to the character. Packard, on the other hand, begins as something of a sympathetic character continually haunted by the lost lives of the men under his command. However, over the course of the film his sadness is turned to rage, and his mission to one of revenge no matter the cost. Unfortunately the rest of the cast is so forgettable that if I hadn’t had to look up their names to write a synopsis, I couldn’t have come up with them when asked. The brief descriptions of who they are and their purpose on the trip is about as much info as the film bothers to give about them, and there are countless other characters played by recognizable actors who get even less description and screen time (Corey Hawkins, Tian Jing, Toby Kebbell, Thomas Mann, and Marc Evan Jackson are all in this movie - you’d probably recognize the faces even if you don’t recognize the names). John Goodman’s character plays a significant role in the early scenes, but disappears for a lengthy period of time before making another brief appearance midway through the film. Tian Jing’s (The Great Wall) appearance in the film seems rather transparently like a choice meant to help their box office numbers in Asia. However, she literally has nothing to do. She stands in the background like literal set decoration. I’m not even sure her character’s name is said once. This is symptomatic of a film with more characters than the writers knew what to do with. The writers (Dan Gilroy, Max Borenstein, and Derek Connolly) do, however, try to be topical with references to one character’s hopes for a World Series win for the Chicago Cubs, and several comments about then President Nixon and the Vietnam war that feel very pointed. Nevertheless, it’s a far cry from the more symbolic Godzilla movies. Here the usual King Kong symbolism of the wild, untamed, natural world being harnessed and ultimately killed in the heart of human civilization is completely absent. Instead, the message seems to be the opposite, as if to say, try as you might, you cannot kill nature. There are, no doubt, plenty of viewers who would have preferred the story maintain its theme of man’s misguided attempts to control or suppress nature ending in its untimely death. Perhaps the constraint of a larger cinematic universe in which Kong can live long enough to fight Godzilla kept the writers from maintaining that theme, but its absence certainly doesn’t help the film. The defense I’ve heard most often for Skull Island is that it delivers on their only expectation: cool monsters and cool fights. In a movie such as this, they don’t care about interesting characters who are well fleshed out and given proper story arcs. “Those scenes only slow down the film and cut down on the amount of monster sized action,” they tell me. However, that’s a bad set of expectations. It grants the filmmakers freedom to make a bad film, and it has certainly resulted in an underwhelming story here. We need interesting, well fleshed out characters, with proper story arcs in order to have something to latch onto. If the only thing you’re interested in is monster fights, rest assured they’ll make their way to YouTube in due time. Then you’ll be able to experience the movie as you wanted it in a much shorter runtime. Yes, it’s a pretty film to look at and the action sequences are occasionally entertaining, but when most of the characters are this underwritten and completely forgettable, there's no reason to care about the action scenes they're involved in. The deaths come quick and often, and none of them matter. It’s a dumb monster movie that genuinely doesn’t seem to understand the King Kong character, nor does it bother to create compelling human characters. I mostly liked the 2014 reboot of Godzilla - I was probably too generous to it in my review in retrospect. Most were disappointed because of the way they avoided showing much of the action early in the film, and only gave us a few choppy fight scenes late in the film, but I thought it was the right choice to let us experience the events through the eyes of a select few human characters. By contrast, Kong amps up the action and casts a lot more famous faces but gives them significantly less to do.